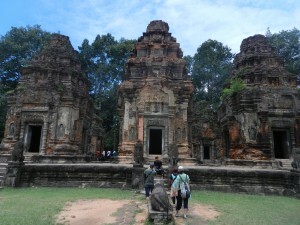 Preah Ko is one of the most important temples that the Khmers built. King Indravarman 1 erected it almost 300 years before the Khmers constructed Angkor Wat–shortly after he took the throne in 877. It set standards that Angkor’s builders followed for the next 500 years. They were so high that remained hard to beat. So one of my first priorities in this return trip to Cambodia was to take a better set of photos than I did 5 years before. At that time, the central section was being reconstructed, and its platform was completely blocked off. I also only had a cheap 35 mm camera–I had no plans to publish anything about Cambodia then. So please come in and savor one of the most influential buildings in Asian history. 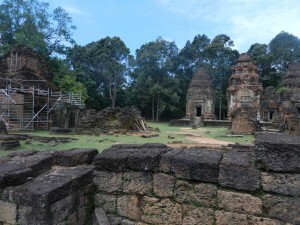 You can read about Preah Ko’s history in an earlier series of posts (Preah Ko Part Two explains ideology behind this temple), or you can first enjoy its visual feasts here. 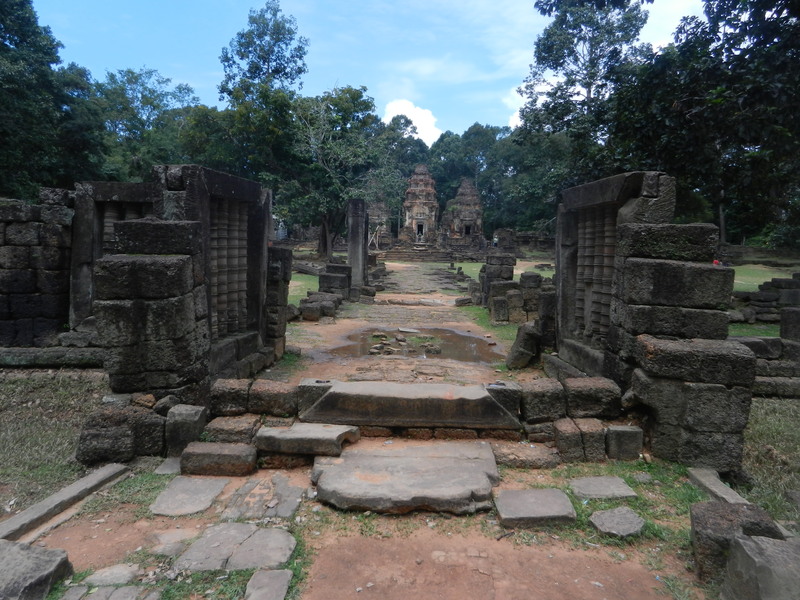 Preah Ko was one of the first Khmer temples to use symmetry on a vast scale. People were migrating into Angkor’s area from the east in the 9th century, and Khmer kings and nobles were marshaling them to clear jungles, plant crops and dig huge canals and reservoirs. 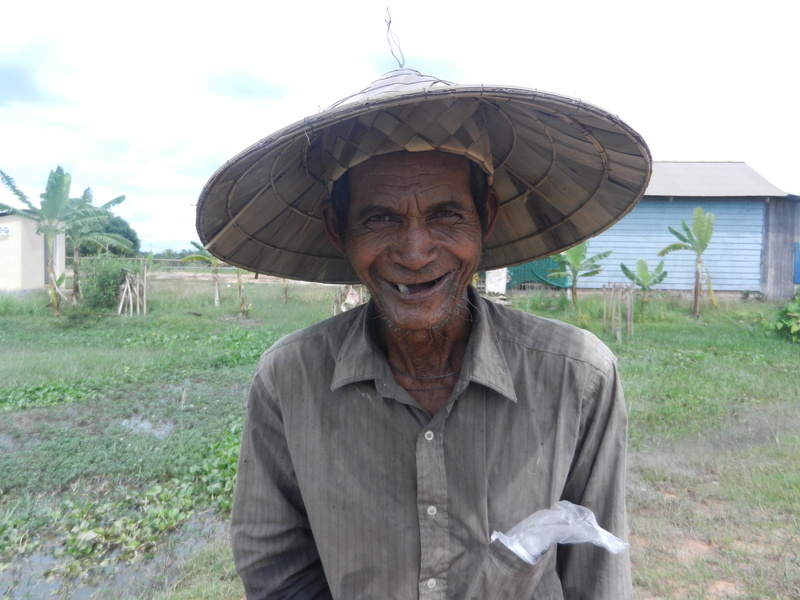 Khmer kings were giving these settlers into a new land a common system of meanings to cohere in. 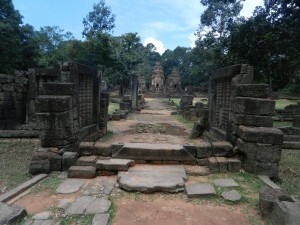 Above is the entrance to Preah Ko–from its outer surrounding wall (poorly preserved now) towards its central towers. Angkor Wat is also a symmetrical system of walls and courtyards that lead you to a central group of towers. Indravarman 1 conceived Preah Ko in this way 250 years before. In the above photo, I walked a few paces towards the center and turned right. 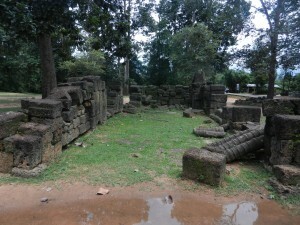 This is the inside of one of Preah Ko’s 8 long rectangular side buildings. Four are on each side, so I saw the same structure on my left. Other buildings and some statues were duplicated on each side of the axis from the entrance to the main towers. Angkor Wat and most other Khmer temples have this bilateral symmetry too. 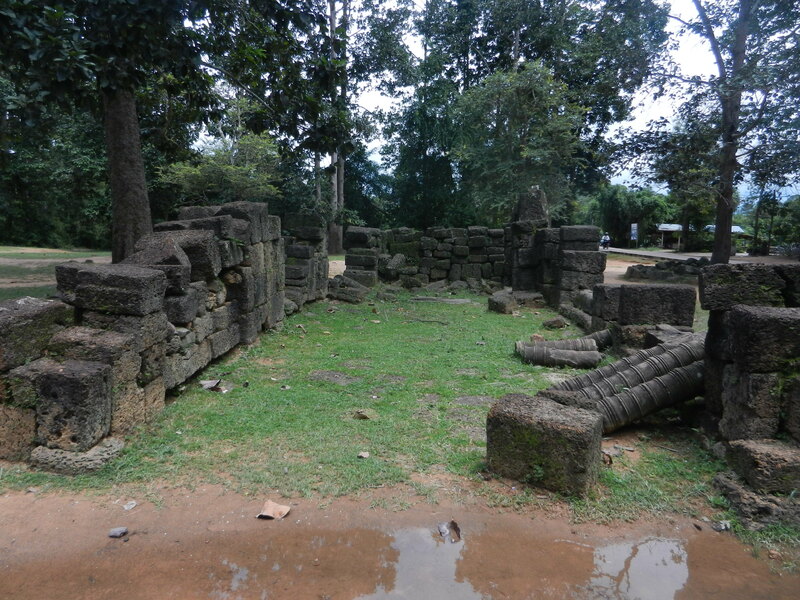 The rituals that occurred in Preah Ko were probably as precisely coordinated as the buildings. I’m a little closer in the above shot–in a T shirt and baseball cap rather than the regal garb of Indravarman and his elite priests. But I could still appreciate some of Preah Ko’s formality. I’m looking from another rectangular building towards a construction which scholars conventionally call a library. Another one faces it from the other side of the walkway towards the center. Angkor Wat and many other Khmer temples have them too. They might have been used for storing many things used in rituals–perhaps texts, incense and gowns. Nobody wanted my T shirt though. Then I arrived at this majestic sculpture. There are 3 of them–one in front of each of the central section’s front towers. The bull is Shiva’s mount. 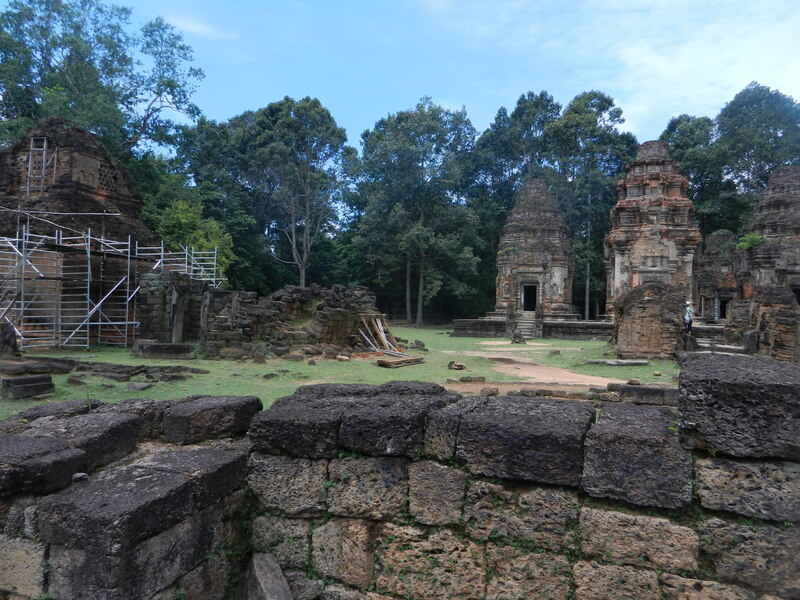 Preah Ko was dedicated to him, like most Khmer temples before Angkor Wat (which is a trophe home for Vishnu). 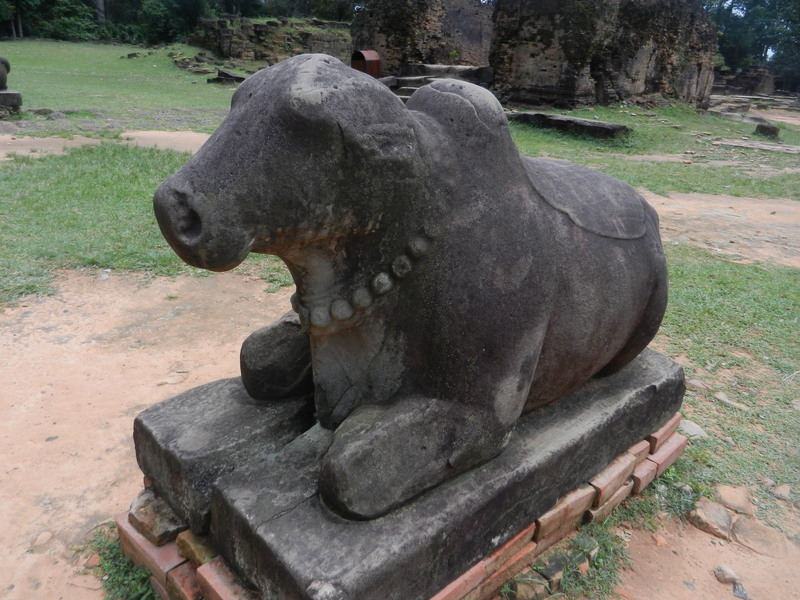 Sculpture from the Preah Ko period is known for strength and aloofness–what its builder probably wanted to project. I was there during the rainy season this time. 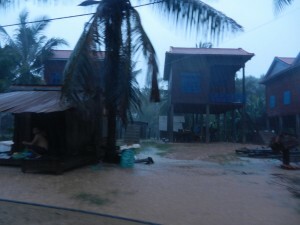 The monsoon slams the area with suddenness and power that make it seem divine. Indravarman and other kings linked this force of nature which fertilized the fields for Angkor’s increasing population with their own authority and with Hindu deities and their priests. Preah Ko’s symmetry and stateliness must have been associated with the regularity of the monsoons–and since the Khmers believed in magic, folks probably thought that they helped ensure the coming of the rains each year. But Preah Ko has another side–it’s not all about power. It also set a standard for elegance, which we’ll explore in a post on Preah Ko. This temple balances strength and refinement so well that I think it’s one of the finest works of art in Asia. You’re always welcome, Keren. I enjoyed exploring Beng Mealea with you.